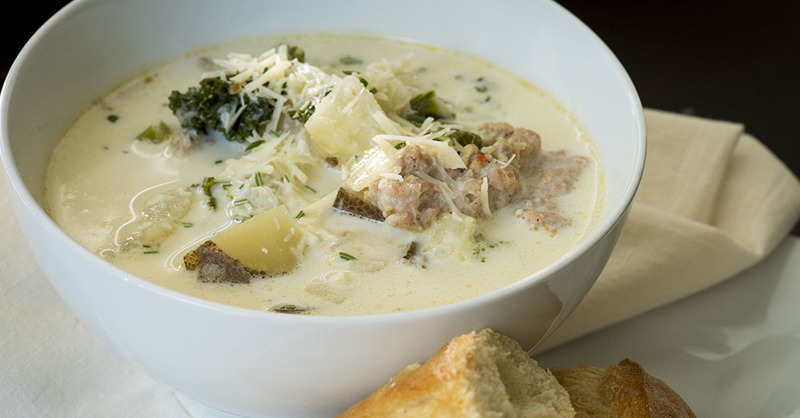 One of the yummiest items on the menu at Olive Garden is their Zuppa Toscana. We love this creamy concoction that’s loaded with Italian sausage and hearty potatoes, a perfect pairing if there ever was one, not to mention the velvety-rich broth that warms us from the inside out. With our super simple recipe you can enjoy this scrumptious soup from the comfort of your own home. The ingredients list is budget-friendly and, while it tastes indulgent, there’s a hefty amount of leafy greens, one of the healthiest foods out there – that’s a win-win in our book! The best part is that your slow cooker does most of the work, making it the perfect dish to enjoy after a long day. Brown Italian sausage in a large skillet over medium-high heat, about 5 minutes. Drain and discard fat. Combine all ingredients except cream and kale in slow cooker. Cook on low 7-8 hours, or on high for 4-5. Add cream and kale to slow cooker, stir, and cook until leaves are wilted and warmed through, 20-30 minutes. Ladle into bowls, serve immediately and enjoy!